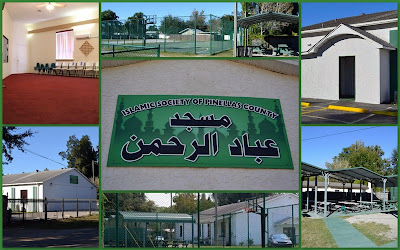 Islamic Society of Pinellas County (ISPC), otherwise called Masjid Ebad Alrahman, is a non-profit organization that represents and serves Muslims in central Pinellas County and neighboring areas. It was founded in 1992 by a group of nine dedicated individuals. They desired the establishment of a local Muslim community that would be self-sufficient and would uphold the teachings of the Qur’an and Sunnah. The ISPC strives to provide for the Islamic, social, cultural, and educational needs of its community. When it first opened its doors in 1992, ISPC was operating out of a rented space in an office plaza. Alhamdulillah, with the help of Allah, the community at ISPC was able to purchase a local church property in full. The ISPC has never relied on any loans or interest, all funds were collected by the help of Allah and the donations from our generous community members. The church property was remodeled and converted into a Masjid, named Masjid Al-Farooq. A few years later, the adjacent land was purchased to expand the parking lot and build a basketball court for youth. The founders of ISPC also opened their own cemetery in the year 1994, which serves hundreds of families in Pinellas County. The community at ISPC was the first in the state of FL to bury according to the authentic Sunnah of the Prophet Muhammad (SAW). In 2010, the Masjid was renamed to it's current title, Masjid Ebad AlRahman which means ‘the servants of the Most-Merciful’. The Masjid grounds were expanded further in 2011 as the two adjacent properties were purchased with the intent of starting an Islamic School. The ISPC continues to fundraise for this project, as there are currently no full-time Islamic schools in Pinellas County. We welcome all Muslims to join us, please check our event calendar for events and programs. Alhumdulillah the community of Masjid Ebad Alrahman is blessed to have a dynamic and multi talented imam in Sheik Saad Abu Abdelhamid. Sheikh Saad is a moroccon-american who lives in Florida and is currently enrolled and studying in a bachelors program in Islamic studies in Mishkah University. He has studied the Islamic subjects and Quranic sciences with the scholars of the repute of: Dr. Salah Assawi, Sheikh Abu Hudaifa Melouk, Sheikh Abou Talha Elmarhoumi and Dr Abd Elbadea A. Hesham to name a few. He has Mastered the Ahkam of recitation with Sheikh Abu Hudaifa and Dr. Almohamadi Altholoth. Previously he served as the Imam in many masjids including Masjid Al-Sunnah, Kissimmee, FL and Masjid Dar-Alhuda, Davenport, FL. Masha Allah he is fluent in four languages: Arabic, English, Spanish and French. He is conversational in Portuguese. He is an active member in the Judeo-Christian-Islamic Covenant for Peace and is also the co-host of the radio show Islam for Mankind La Magica 1220AM every Thursday at 1:10PM in Arabic, English and Spanish. Please check Sheid Saad's personal website for more information about him and to access his lectures, Friday sermons and videos etc.